Marion is located just a few miles north of Verona on the site of a fine 15th-century villa in the valley of Marcellise. Bought by the Campedelli family in 1986, and run by the genial Stefano Campedelli together with his wife, Nicoletta and brother Marco, the estate lies just outside the Classico zone on predominantly chalk soils. They began bottling in 1995. Since 2006 they’ve been assisted by the talented Damiano Peroni. The soil here is calcerous, and the vineyards are on terraced slopes, the older vines, planted in the 1950s, trained to the traditional pergola, the younger vines, planted by Stefano and Nicoletta, are Guyot pruned, far easier to manage in terms of containing yield. The philosophy here is to make fresh, balanced wines from the healthiest possible fruit, within which there is an inherent recognition that the most important work takes place in the vineyard. Winemaking is low-intervention, and the wines are aged in 500 litre barrili and larger botti of Slavonian oak in order to minimise woody notes. The resulting wines do not follow the convention of dark, opaque colours, but are usually more delicately and transparently hued. Nearly all the wines are made with a percentage of dried grapes. 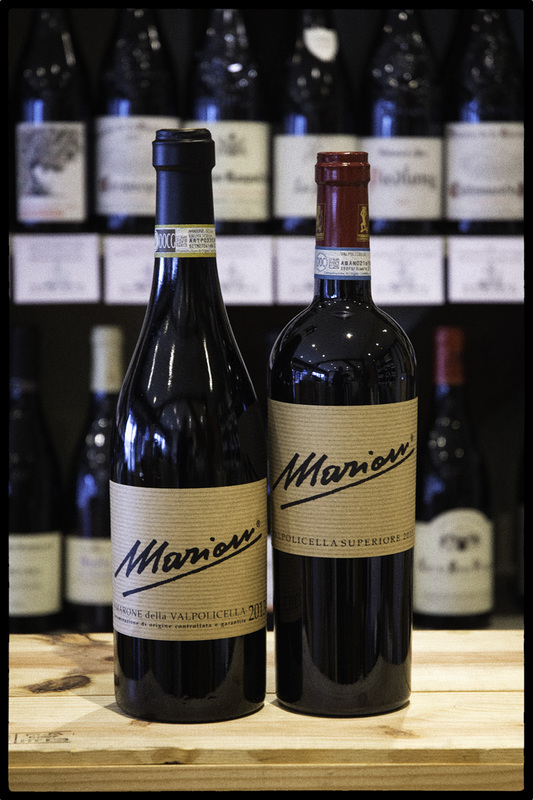 This does create quite a bit more work – for the main Superiore blend, essentially two wines are made. The first, comprising some 70%, is harvested a bit earlier and vinified conventionally under natural yeasts to bring freshness, whilst the fruit of the 2nd tri is left to dry until mid-December before fermentation, and is made with body and power in mind. The two are then combined in varying proportions until the right balance is achieved. In 2008 this was generally 30% dried grapes, but in hot years like 2003 none is used at all – the grapes were already quite raisin-like! The Amarone comprises the fruit of the oldest and best-sited vines, which is carried into the modern frutaio for appassimento, where they gently desiccate in the plastic bins in which they were picked until mid-December. The dried grapes are then cold-soaked for 24 hours before they are allowed to spontaneously ferment under their natural yeasts. There is no post-fermentive maceration here, for the objective is not power and extraction, but soft approachability. Ageing takes place over three years in barrili and botte before the final selection and blends are made. This is Amarone della Valpolicella that provides pure pleasure, with soft, gentle textures, structure that is impressive but never mean, gorgeous fruit from healthy, ripe grapes, absolute balance, and a long finish. Drink it with hard, aged cheese, or with roast or grilled meat, or just drink for sheer pleasure.